Jackie Freimor has been teaching the Music Together® program to families in southern to mid-Westchester County, New York, since 2005. Music Together is an internationally recognized early childhood music program for babies, toddlers, preschoolers, kindergarteners, big kids, and the adults who love them! Research-based and developmentally appropriate, the Music Together curriculum helps families, caregivers, and early childhood professionals rediscover the pleasure in and educational value of informal musical experiences. Over the years, we've had as many as 11 locations and 400 families enrolled in the Music Together classes each semester, and we've also taught the program in several local preschools. 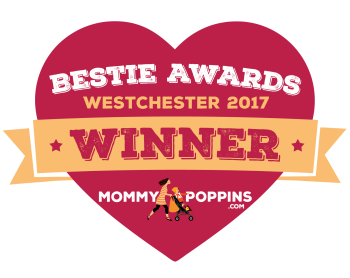 We currently run classes in 3 towns: Chappaqua, Scarsdale, and Tarrytown. In 2013, we began offering Jackie's own Uke U. program (not a Music Together offering). Uke U. is a mommy-and-me beginner ukulele class, where parents and children enjoy a fun and semi-formal introduction to playing the ukulele. If you have any questions, please contact us. We'd love to see you and your family in class! Registration for summer Music Together, Uke U., and Uke Too classes is open! Register here for Music Together classes and here for ukulele classes! New this summer: 2-week camps for your 5- to 7-year-old. Register here for camp! Our 10-week spring semester, featuring the Tambourine collection, began on April 8, but registration is still open! You can register by clicking here. ...are offered before each semester or session begins. Click here to sign up! ...please call the office at (914) 924-0995 after 7:30 am. There will be a voicemail message letting you know whether classes have been canceled. Stay safe, everyone!